This post contains affiliate links which means if you buy products through links in this post I may earn a commission. Read my full disclosure.I received free product and/or a gift card for this review. All opinions are my own and not influenced in any way. Read my full disclosure. 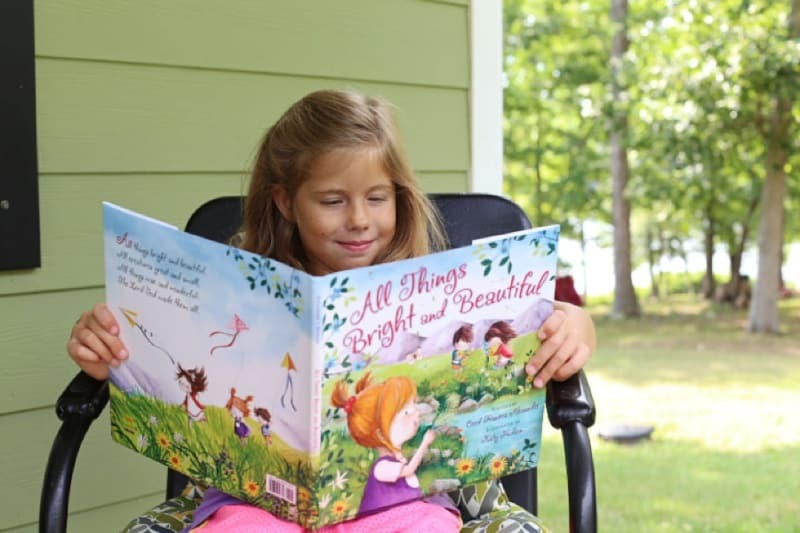 When my 7-year-old happened to be looking over my shoulder as I opened the email about reviewing a new picture book, All Things Bright and Beautiful, she immediately begged to review the book herself. She loves beautiful words and pictures as much- maybe more- than her Momma! All Things Bright and Beautiful combines the words of the classic hymn first published in 1848 by Cecil Frances Alexander with beautiful watercolor illustrations by Katy Hudson. The illustrations follow two little girls and their brother through a day of discovering nature with their family. 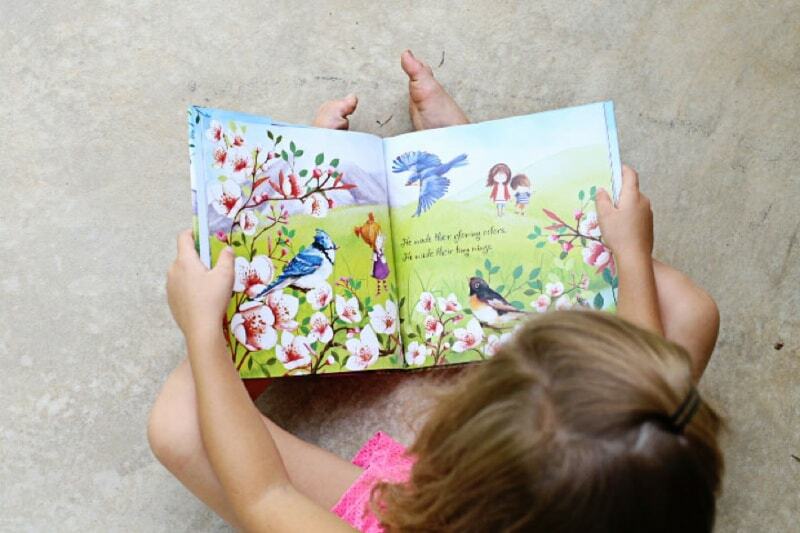 While each page has just a few lines of text, Peyton spent several minutes enjoying the beautiful illustrations, and discovering God’s creation on each page. Peyton’s favorite part of the book, is when the day turns to night, and the 3 children (and their parents) end the day camping in a tent. Since my family has recently fallen in love with camping, the book really resonated with Peyton, when discovering the beauty of nature and family time wrapped up together in the end. 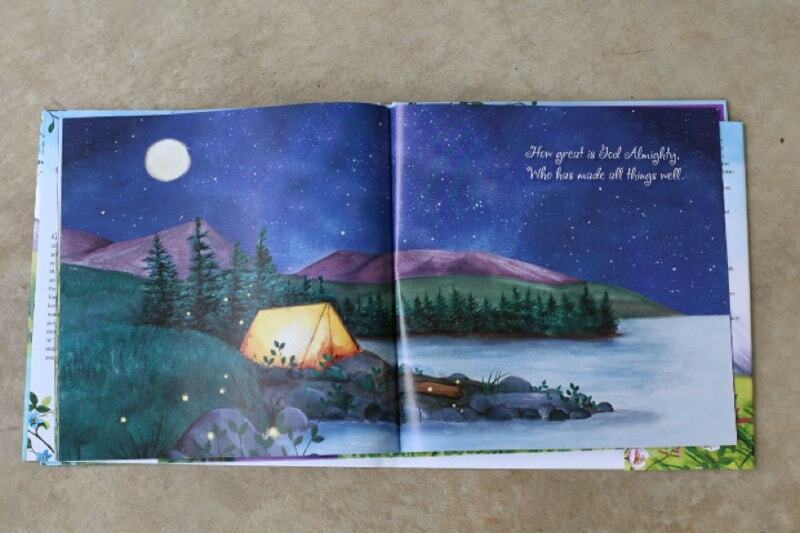 All Things Bright and Beautiful will be a favorite bedtime story for years to come at our house! Enter to win a copy for your family below. Disclosure (in accordance with the FTC’s 16 CFR, Part 255: “Guides Concerning the Use of Endorsements and Testimonials in Advertising”): Many thTTanks to Propeller Consulting, LLC for providing this prize for the giveaway. Choice of winners and opinions are 100% my own and NOT influenced by monetary compensation. I did receive a sample of the product in exchange for this review and post. Only one entrant per mailing address, per giveaway. If you have won a prize from our sponsor Propeller / FlyBy Promotions in the last 30 days, you are not eligible to win. Or if you have won the same prize on another blog, you are not eligible to win it again. Winner is subject to eligibility verification.